Way back at some point in our pre-parenthood lives (2008, maybe? 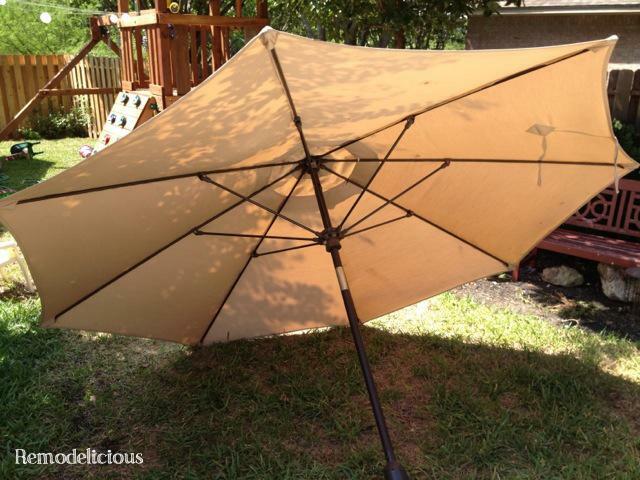 ), we bought a patio umbrella that lacked a little pizzaz. Our patio table was one of our favorite relaxation spots, but also had little light in the evening. Without an outlet handy in the middle of the patio (who does? ), we opted to string up 2 sets of fancy new LED solar string lights with zip ties and dropped the solar panels out of the umbrella’s vent. 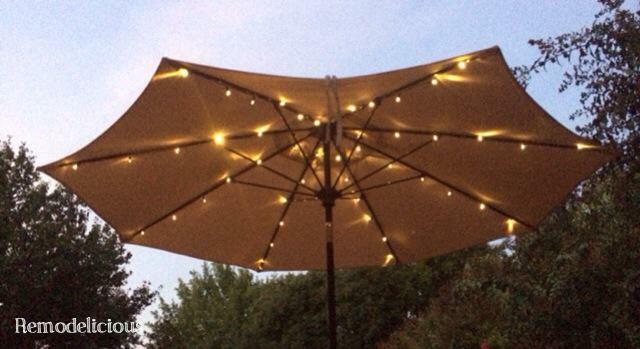 While “Fix the Patio Umbrella Lights” was on the “to-do” list, I happened upon this set of solar patio umbrella lights for around $30 at Lowes (couldn’t find them online). I’d looked before, but sets like this were in the $100 range for a pretty low-quality light so I jumped at the deal. After removing the old lights (saved for repair for a future project for now), I was left with a blank canvas on our standard-issue patio umbrella. As a side note, this umbrella is a budget one ordered from patioumbrellas.com years ago. They have since been bought by Hayneedle and this umbrella now cost MUCH more than we paid (over twice), so try amazon.com if you’re looking for something affordable! 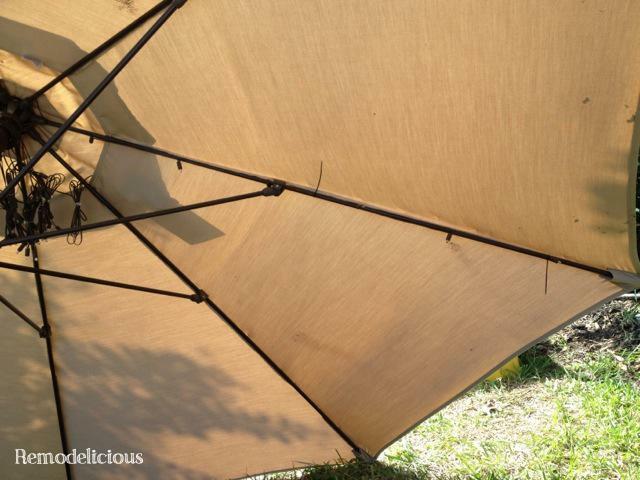 It has held up well for an inexpensive umbrella and is just now getting some small thin spots. We used to close it for the rain, but found that keeping it open is better since it can dry faster. We had mildew stains long, long ago, but after trying everything to remove them, it turned out that it just needed some sun. I wouldn’t say that we abuse the thing, but we don’t baby it either. It is out year-round since here in central Texas, we can have an 85-degree, sunny afternoon a day after a “snow storm” – which here in Texas is the term we use for a snow flake. Here is the only damage our umbrella, purchased in 2008, has to show. It’s hardly noticeable, but we probably will replace the canvas part sometime in the near future, although that’s partly because we’ve been discussing other colors. … and a clip that holds the solar panel to the vent of the umbrella (just pass the panel through from the inside). 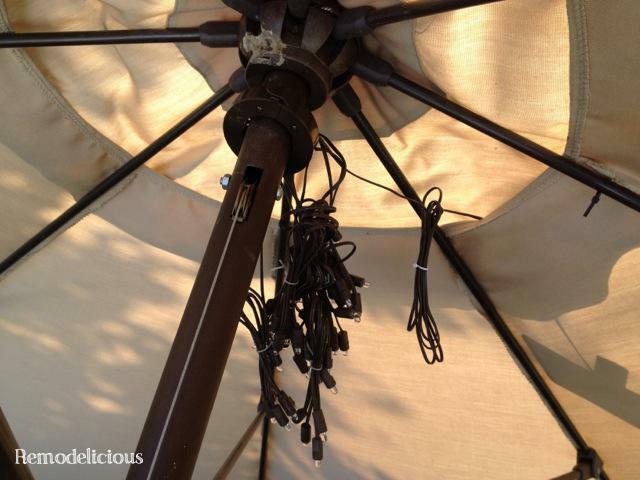 Small zip-ties were included to attach the lights to the umbrella. This was a great part to enlist toddler help to hand off zip-ties. I used 3 for each run and had plenty left over. 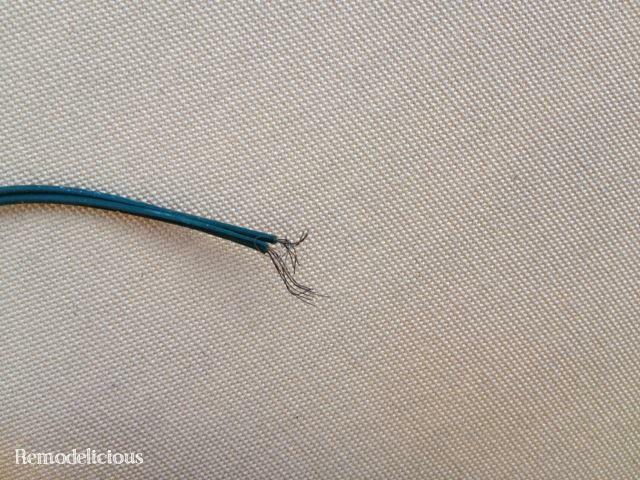 In no time, everything was assembled and I snipped off the excess from each zip-tie. Don’t expect these to give a ton of light. If you’re playing cards, you’ll still want another light on. These give a nice glow that may help you find your glass of wine, but is mostly decorative. Along with our landscape lighting, it’s plenty to help us find our way around in the evenings. Would you mind if I use these pictures in an upcoming guide? Will link to this post as inspiration of course! LEDs are extremely energy efficient and consume up to 90% less power than incandescent bulbs. Since LEDs use only a fraction of the energy of an incandescent light bulb there is a dramatic decrease in power costs.